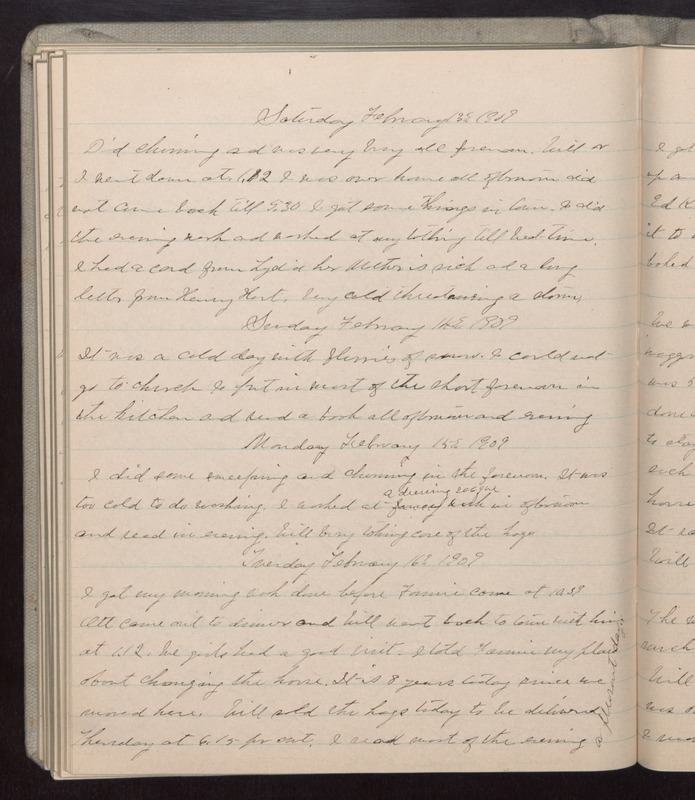 Saturday February 13 1909 Did churning and was very busy all forenoon. Will & I went down at 1.12 I was over home all afternoon did not come back till 5.30 I got some things in town. I did the evening work and worked at my tatting till bed-time. I had a card from Lydia her Mother is sick and a long letter from Henry Hart. Very cold threatening a storm. Sunday February 14 1909 It was a cold day with flurries of snow. I could not go to church I put in most of the short forenoon in the kitchen and read a book all afternoon and evening. Monday February 15 1909 I did some sweeping and churning in the forenoon. It was too cold to do washing. I worked at a dressing sacque in afternoon and read in evening. Will busy taking care of the hogs. Tuesday February 16 1909 I got my morning work done before Fannie came at 10.39 Ott came out to dinner and Will went back to town with him at 1.12. We girls had a good visit. I told Fannie my plan about changing the house. It is 8 years today since we moved here. Will sold the hogs today to be delivered Thursday at 6.15 [per cwt?] I read most of the evening a pleasant day.